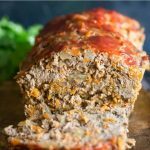 This easy Paleo Meatloaf is made with ground beef, onions, carrots and a variety of delicious herbs and spices, so it’s full of fiber and vitamins too! I wanted to make a Paleo Meatloaf that was also a great fit for people who also want a Whole30 meatloaf, and it’s a perfect fit fo that diet too, and I even have a recipe for home made paleo ketchup too! Traditional Meatloaf recipes often include some sort of grains like dried breadcrumbs, some people even use oatmeal. As we’re making a Paleo Meatloaf (that’s also Whole30) we are skipping all of that, and the milk that is sometimes added and replacing it with much more nutritious and fiber rich shredded vegetables. I’m not exaggerating when I say this is one of the best paleo meatloaf recipes I’ve tried! Now of course I’m biased and there’s a big subjective element to it! But, the vegetables add a depth of flavor to the meatloaf that you simply don’t get by adding breadcrumbs. I opted not to replace the breadcrumbs in the meatloaf with another grain, almond flour or coconut flour would be the obvious choice here for a Paleo meatloaf. But, I don’t think it’s needed plus they are fairly expensive to buy if you don’t normally cook with them and the meatloaf binds together pretty well, although my Paleo meatloaf texture is not exactly the same as a traditional meatloaf. STEP 1 – Shred your vegetables using a grater, food processor or if you have non of those you can very finely chop them by hand. STEP 2 – Then, Saute the vegetables in a skillet for about 5 minutes until they are soften up, you do not want to brown them. STEP 3 – Next, Mix all the Paleo meatloaf ingredients together including the vegetables, you may need to get your hands in there to mix it all up properly! 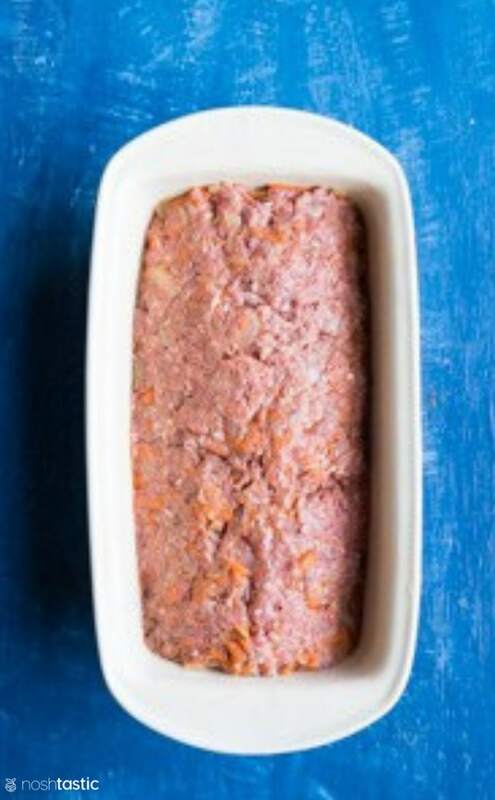 STEP 4 – Put the Paleo Meatloaf mixture into a loaf pan and shape the top a little bit by hand so that it resembles a loaf. 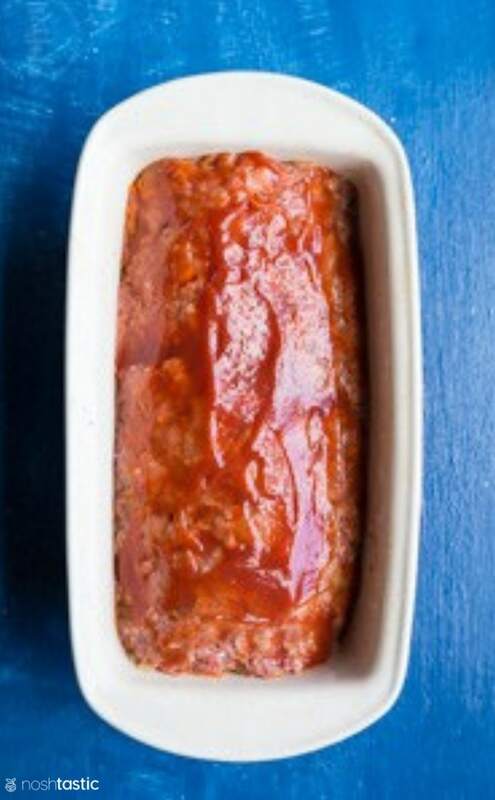 STEP 5 – If you have some Paleo Ketchup you can spread it over the top of the meatloaf, if not you can skip this step. STEP 6 – Cook your paleo meatloaf for about 1 hr, then let it cool just a little bit. It is a bit more crumbly than regular meatloaf so I wouldn’t try to get it out of the loaf pan when it’s still really hot. The gravy is optional and is best made with homemade broth or a really good quality beef stock or broth. I used a Paleo ketchup for the topping, you can omit that if you prefer. If you’re still missing the breadcrumbs then this delicious recipe for Paleo Sandwich Bread from my friend Lindsay at Cotter Crunch should make up for it! 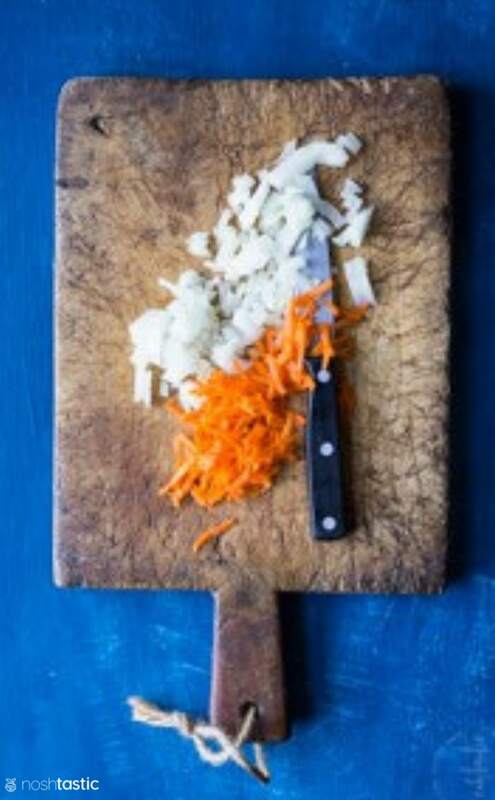 TIP 1 – You can easily prep the grated carrots and onions ahead to save time. TIP 2 – If you don’t want to make your own paleo ketchup you can skip this step, it will still taste great! TIP 3 – Chop the vegetables small! if you don’t the meatloaf may not hold together quite as well. TIP 4 – This will make six servings, but if your family eats a lot like mine do you may want to double it. Ceramic Loaf Pan – I have two of these gorgeous ceramic loaf pans! Cutting Board – You can’t go wrong with this set of cutting boards, and you can wash them in the dishwasher. 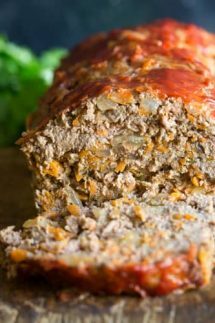 This Paleo Meatloaf is packed with flavor and added vegetables and is also a perfect Whole30 meatloaf recipe. Saute the onions and carrots together in the oil until the onions are soft but not browned, about five minutes. In a bowl combine the beef, onion, carrots and all remaining ingredients (except the Paleo ketchup) and mix really well, you might need to get your hands in there! Put the loaf pan onto a sheet pan (in case any juices come over the sides) and bake in your oven for about 1hr - 1hr 15 mins. Depending on how high the fat content is in your ground beef, you might find that the meatloaf is swimming in fat when you take it out of the oven. This is normal and the meatloaf itself will not be too fatty as most of the fat will have rendered out during cooking. Let it cool a little bit and remove from the loaf pan and put it on paper towels to absorb any excess fat, I think if you try and lift the meatloaf out when it's super hot and right out of the oven it may fall apart. The gravy is best made with homemade beef broth or a good quality Paleo broth. In a pan add the beef broth, coconut milk, and fish sauce. Mix well and simmer on a medium heat for five minutes. If you want to thicken your gravy you can use about 2-3 tablespoons of arrowroot mixed with about a tablespoon of cold water or cold beef broth. Remove gravy from the heat and add the arrowroot mixture, stir really well then return to a low heat until the gravy thickens. Just made this – no changes to your recipe. It was a hit with the wife! Thank you! 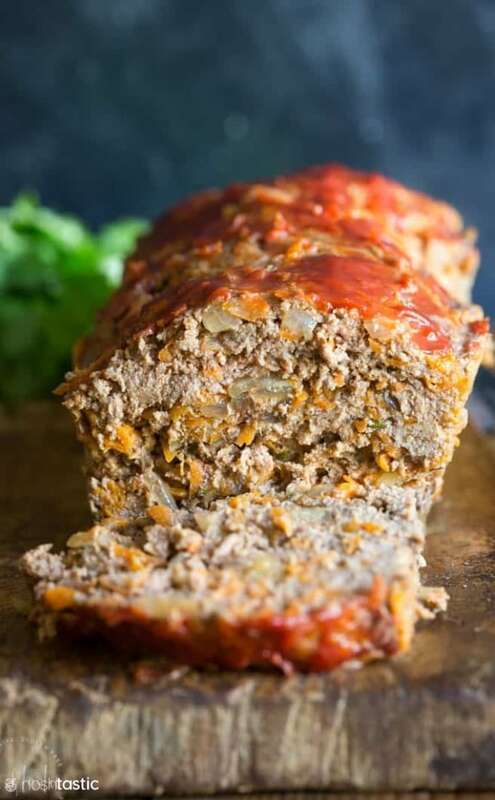 A good paleo meatloaf recipe is hard to find – coconut or almond flour always seem to make it a bit too dry or something and I personally haven’t been crazy about the many recipes I’ve tried. BUT this recipe, this is genius! Carrots and onions as a binder not only keeps it from being dry, but sneaks in extra veggies! I’ve made this a few times now and it is awesome just as the recipe is written. Don’t skip the optional gravy – it may not sound like much but is simple and brings it all together. I have also made it with the carrots, onions and tomato paste but different seasonings (well fed Italian sausage seasoning is my personal fave), and it’s great also. So thank you for helping me find my “go to” paleo meatloaf recipe!! Great recipe, also works great for stuffing peppers. Hi Betty, that’s a neat idea to stuff peppers with it, I’ll need to try it! 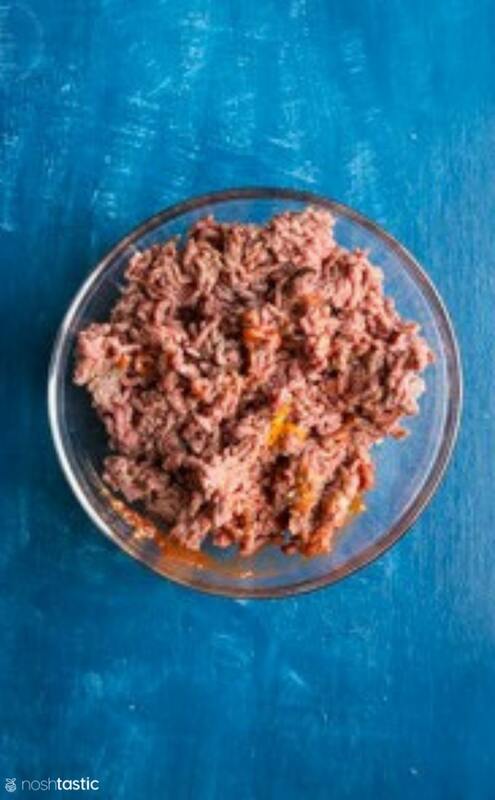 Would it be alright to swap beef for ground turkey? Hi Rebecca, I think that should work but the texture might be slightly different. Hello, this sounds great, but I also have a tomato allergy,any suggestions? Hi Kathey, I would simply omit the tomato in the meatloaf mixture and not add any ketchup topping, it will cook in the same way. Thank you for this recipe…esp the gravy! what a treat! I was worried the loaf didn’t incl an egg but mine held together really well. I went w/out the ketchup, thyme and mustard powder but only bc I didn’t have those things. I added fresh shitake mushrooms…I just love how mushrooms add flavor and keeps the loaf moist. Next time, I’m sure the thyme and mustard will make it even tastier! Hi Ian, I’m so glad you liked it! The mushroom addition sounds lovely, I need to try it like that. We Love Love Love the meatloaf!!! Smells so good outside to the neighbor’s next door. I was wondering about the gravy. Mine came out much much lighter “whitish” than in your photos? Flavor? I need help on this one. I’m so glad you like it 🙂 The color and flavor (or lack of either) in the gravy is probably to do with the brand of beef broth you used. It’s not exactly like regular gravy as it has no meat drippings in it so the taste is not quite the same. What brand of beef broth do you prefer? I typically use Swanson’s if I’m not doing Whole30 as it’s gluten free and easily available. If I’m on Whole30 I either make my own (which will make really nice gravy) or I try to find one in Whole Foods that’s compliant or I get Kettle and Fire brand from Amazon, but it’s kind of pricey. I haven’t been able to easily find a W30 beef broth (or chicken for that matter) in my local Kroger. Thank you so much. I will try the gravy with your preferred brands of beef broth. I love this recipe, it’s really nice! Curious if you know what other applications I can use for the sauce since theres so much left over? What happened to your paleo ketchup recipe? I loved it on top of the meatloaf! I am trying to start removing gluten from my families diet and I am very interested in going start a Paleo routine as well. However, I have a lot of issues with allergies such as Coconut in any form, all nuts, mustard, and dairy. Then due to health reasons no seeds, I usually remove seeds if possible. I have started using avocado oil, this was recommend by a clinic as a substitute to coconut oil. But other products such as the coconut amino’s I cannot use. Do you have any substitutes you can suggest? i would appreciate any help you can give me! Hi Lisa, I know that must be such a challenge trying to remove all those different things from your diet! 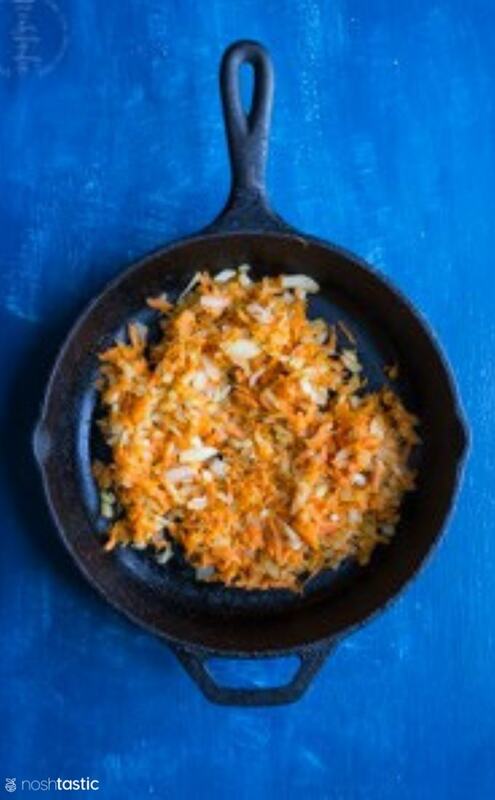 I think this recipe will work well with just removing the coconut aminos, you might want to add a little Worcestershire sauce (not paleo, but gluten free in the USA) or just skip that. I don’t think there is a sub for coconut aminos unless you want to try gluten free Tamari but that’s also not paleo and made from soy. This turned out great! I omitted the carrots and used Bragg’s in place of fish sauce in the ketchup and it turned out so yummy!!! I am not even strictly paleo, and I absolutely love this recipe! Meatloaf is a comfort food for me, and this one does not skimp on flavor. Made it exactly as shown in the recipe. Served it with a roasted garlic cauliflower/potato mash! 😛 so good! Thank you! Love this recipe, I’ve made this a dozen times. I can’t have onions so I use green parts of leeks and some mushrooms. Love your ketchup too, it adds so much and I have missed it since not being able to tolerate store bought. I’m so glad it works for you Rhonda, that’s great to hear!